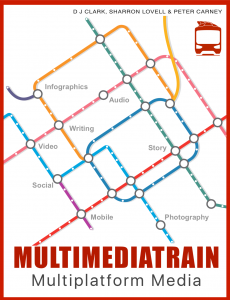 Multimediatrain has been designed as a modular multimedia training course – you’ll find the different modules, (writing, photography, video and so on) running along the top menu. Simply choose the module you want to learn about and work through the pages in the drop-down menu from top to bottom. Training is primarily delivered in sequenced video tutorials, but you’ll also find text and recommended assignments to help you along your way, in the infographics session there are downloadable files to help with the training tutorials to get you started. We cover six disciplines – writing, photography, audio, video, infographics and mobile. Each module starts with the very basics and is designed to give you a jump start in your chosen discipline. Perhaps you are an accomplished writer who needs to take pictures to supplement articles, or a photographer moving into video. More likley however you, like many journalist today, want to tell stories with multiple media on multiple platforms in a way that covers your story best. You don’t need to work through the disciplines in any particular order. Simply navigate to the skills sets on the left side bar and start learning. You’ll also see we have a resources section, right now this is a little scant, but we hope to build this in coming weeks and months. Please do contact us if you have any good resource material you think we should link to. Multimediatrain is bought to you by three Multimedia lecturers and practitioners working in the field, to find out more about us, check out the contact page.